Palomino Properties is a family-run real estate with over 22 years experience in Mijas, on the Costa del Sol, Spain. Virginia Palomino and Carolina Vergara are Gestores Intermediarios en Promociones de Edificaciones” (G.I.P.E. ), Association which in turn belongs to the European Confederation of Estate Agents. 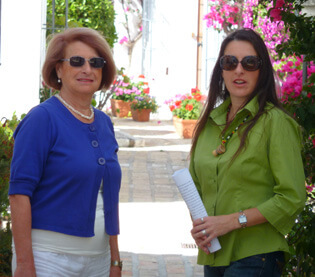 We are a mother and daughter team that have been active in Mijas Pueblo since January 1990. We are licensed to operate everywhere in Spain, but concentrate our activities mainly on the Costa del Sol area. We are members of a professional data base together with over 200 collaborating agents along the coast. All are experienced professionals, sharing a common database with over 14.000 properties listed, ranging from a small studio apartment to magnificent penthouses and luxury villas; commercial premises; plots of land, etc. We are all bound to a strict code of ethics that guarantee a fair and transparent service to our clients. As a member agent, we offer you a large and diverse selection of properties currently for sale, our own direct listings plus those listed by our fellow member agents. Prospective clients can rest assured they will receive the widest range and best property buying service possible on the Coast. Location: Our office is conveniently located at the entrance of the picturesque Andalusian village of Mijas, just thirty meters on your right as you enter town. Mijas Pueblo is at an altitude of approximately 500 metres over sea level. It enjoys a slightly drier climate than down on the Coast. Conveniently close to all amenities and services, with the added value of panoramic views, clean air and tranquillity. Distances: We are 30 minutes from Malaga capital and 20 minutes from Málaga International Airport; 20 minutes from Marbella; 1o minutes to the beach, major shopping centres and entertainment. Gibraltar is an hour’s drive away, where you can also take a ferry. Sierra Nevada Ski resort, Granada and its famous Alhambra Palace, Cordoba and it’s unique Mosque and monumental Sevilla are all approximately 2 hours away. Please, drop us an e-mail or stop by our office and tell us all about your purchasing plans! We will be delighted to help you.